The Biggest soccer publication in Africa! The leader in the latest local and international soccer news — Mokoena VS Nyongo – Who Scored The Better Belter This Weekend? With Teboho Mokoena and Tapelo Nyongo spectacularly getting on the scoresheet this past weekend, which player do you think scored the better effort? 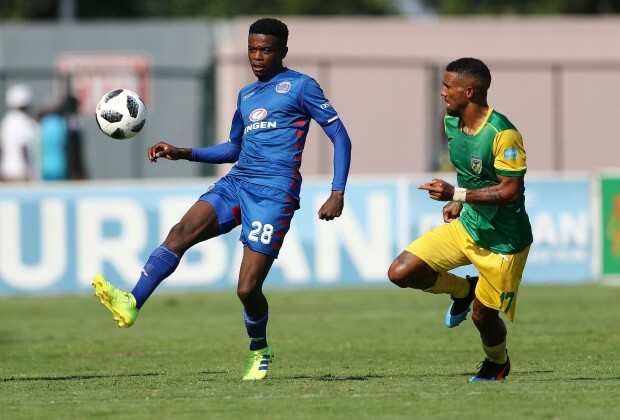 Local footy fans were treated to two goal of the season contenders this past weekend, when SuperSport United’s Mokeona and AmaZulu’s Nyongo pulled one out of the top shelve to be the difference on the day for their respective teams. In Mokeona’s case, SuperSport needed an 85th minute winner to fend off a spirited Golden Arrows outfit with the midfielder being the outlet with this belter. When AmaZulu faced Cape Town City this past weekend, Usuthu came up against a Mother City outfit that were on the back of a seven game unbeaten streak in all competitions. It took a 64th minute free-kick from Nyongo to be the difference on the night, with goalkeeper Peter Leeuwenburgh unable to save the AmaZulu man’s thunderous shot. Who do you think scored the better goal?